Held last night at the Concert Grounds of SM Mall of Asia, a galactic big bang happened as more than a dozen of OPM stars collided with one of the world's top performer to bring one outstanding concert that were made just for the solid fans of Coca-Cola. 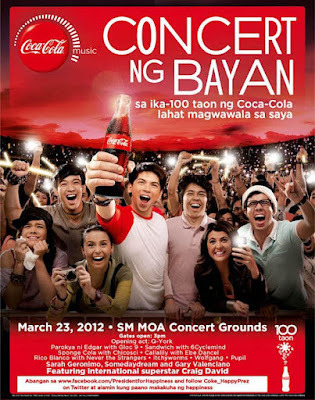 And in this 100th year of Coca-Cola Philippines, happiness poured in as Jose, Wally, MYX VJs, Itchy Worms, Ebe Dancel, Callalily, Sandwich, Jay Durias, 6Cyclemind, Gracenote, Banda ni Kleggy, Wolfgang, Gloc9, Parokya ni Edgar, Never The Strangers, Sponge Cola, Chicosci, Rico Blanco, Pupil, Someday Dream, Sarah Geronimo, Gary Valenciano and Craig David filled our night with great music and interesting numbers. I personally enjoyed the medleys and collaborations of some bands and solo artists! It was, for me, the highlight, of every part. But of course, when Sarah, Somedaydream and Gary sung the newest Coca-Cola soundtrack, Tuloy, so from the nerve racking scream to the swaying of the hands, everything went so dramatically heart-wartming - something that only Coca-Coal can give! Here are some of the photos that I took during the show. Too bad, I didn't made it to the last performer, since all of my gadget died on me, but nevertheless, I really enjoyed this "want-to-sawa" concert for all! There were also some freebies that were given away, including Coke caps and coke products! I also spotted the Happy President that night rocking his heart out with the crowd! What a cute president! Stay tuned for my upcoming blogs about this Concert ng Bayan and also for the thousand of pictures that I took that night on my fan page http://www.facebook.com/RecycleBinofaMiddleChild! Or you can also visit www.coca-cola.com.ph for more updates and happening for this 100th-year celebration. You can also get updates from the President for Happiness himself, Caloy, through his Twitter, @Coke_HappyPrez and Facebook fan page. Thank you Coca-Cola for that spectacular concert! I hope this won't be the last!